As Charles Whelan pointed out in Naked Statistics: Stripping the Dread from the Data, statistics can be either entirely boring or really exciting depending on context. They can also be extremely powerful if used in the correct manner. We now have many responses to the travelabulous travel planning survey, likely thanks to many of you reading this post right now. We ran the survey for a number of reasons including getting help with funding and refining our go-to-market messaging. However, the biggest reason for running the survey – by far – was validating if this problem was significant enough to solve and, if so, how should we go about solving it. Looking at the first part of this statement – is this problem significant enough to solve? Well, we have already collected enough data to say that we are accurate to within -/+ 8% 19 times out of 20. In English? Even if our data is optimistic by 8%, is this still a big enough problem that it requires a solution? You bet! It isn’t even close. But, I will leave this for another post. In this post, I want to tackle the second part of my statement above, specifically, “how should we go about solving this problem?” As I pointed out in a recent post on solutions to elegant problems – and as anyone who has ever worked closely with me knows – solving your own problems does not make a whole lot of sense. You really have to take an outside-in view when creating products and services or you are going to find yourself with a slick product that no one wants. Get to the point, Kirk! Here it is … we know that we can’t “boil the ocean” with our first release so I put forth the hypothesis that maybe we should have our first release focus on “event-centric” travel planning. Why? I do this all the time. Where is RUSH touring? One of my favourite actors is in a play on Broadway or the West End … can we get tickets? When is the Edinburgh Fringe Festival? 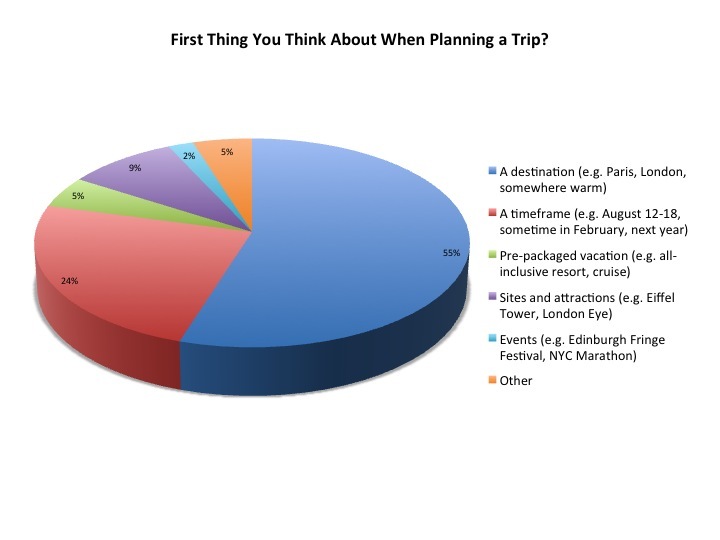 What is the first thing you usually think about when planning a trip? Overall was I wrong? Not just to keep my ego intact, but I don’t think I was wrong at all. Clearly my hypothesis was dreadfully wrong, but the important point is that we validated this hypothesis before we assumed it was “fact”. Had we not validated this hypothesis, and if I managed to convince everyone else involved that I was “right”, I think we can safely assume that this would have been an unmitigated disaster. I can clearly see that future where we are still not making money, have burned through our own investment, and maybe some grant money and other investor dollars having disappeared as well. Ego crushed, disappointed parties, and looking for a job. Gross! March 2, 2014 in Entrepreneurship, Travel.